Another photo from my recent visit to the Hula Lake, where more than 50,000 cranes are staying for the winter. This is an early morning photo, with the sun barely up and lots of fog around. I used the fog to my advantage as the Crane is nicely visible, but the bush behind is already blurred out by the fog. What do I like about this photo? The use of the fog, as described above. I did use an open aperture to have a shallow depth of field, but the proximity of the background to the Crane would have made the effect less obvious than with the fog. 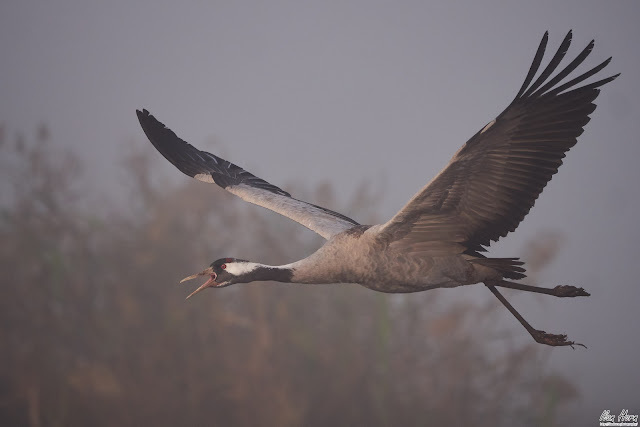 There's lots of details on the Crane, who is in a beautiful pose with stretched wings and neck, and its beak open making his trademark siren-like noise. What would I like to improve? More light would have allowed for more details and better colors on the Crane (but the point of the fog is limiting the light, I suppose).